The following article is reproduced from a posting to the owwm.org "Shop" forum by Barry Willis. I recently bought an old Delta "DP220" 15" drill press which had a broken switch. Some of these old Delta switches can be hard to come by. (Boy, I sure hope so, after the work I put in on this.) So I fixed it. I always enjoy sharing too, so I documented what I did. I hope you enjoy this. 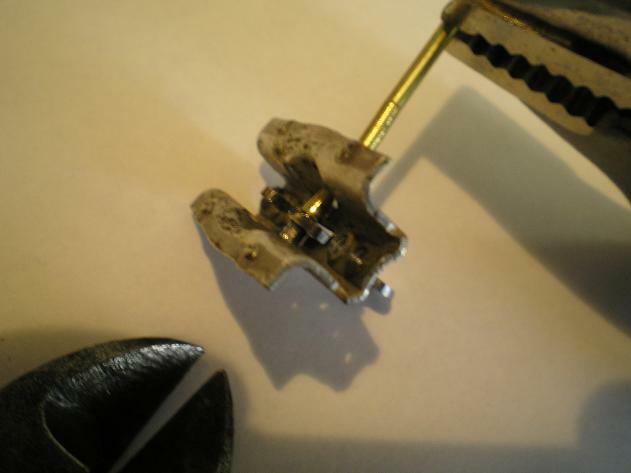 You can see above that the metal toggle snapped clean off. 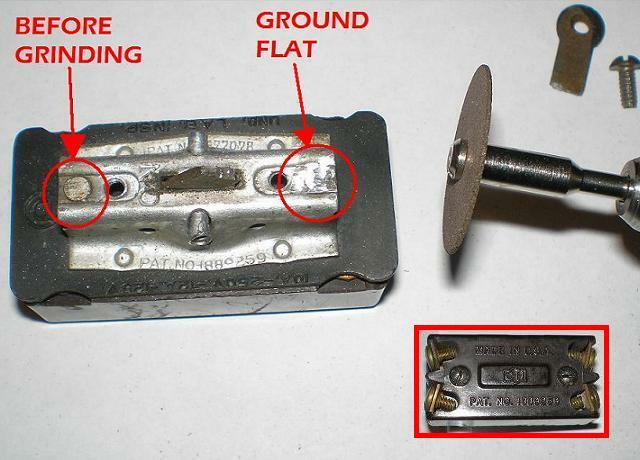 The pic below shows the bolts that protrude through the top of the switch (see BEFORE GRINDING) up from the bottom (see inset). Apparently Cutler Hammer never intended for these switches to be taken apart. Well. They pressed the bolts flat (or something like that) on the switch top to prevent them from being removed. 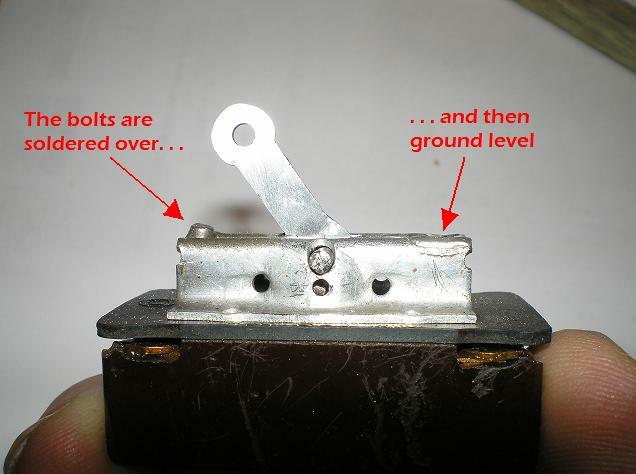 My solution is to simply grind the flat top of the bolts down to the level of the switch top and remove the bolts. We’ll fix the shortened bolts later. Note the lettering on the metal switch top PAT NO 1889259. Also note the similar lettering on the Bakelite bottom. On this switch this lettering reads the same direction. That is, when this switch is rotated on its axis, the lettering top and bottom is left to right. Look for, and note, your switch’s indications of direction so you can reassemble it correctly. This matters. The patent drawing (courtesy Jeff Joslin) might help you visualize the switch internals. It is shown below left. This is a fine time to remove the parts from the Bakelite bottom for cleaning and lube, but take care to note the direction and orientation of every part. This matters too. 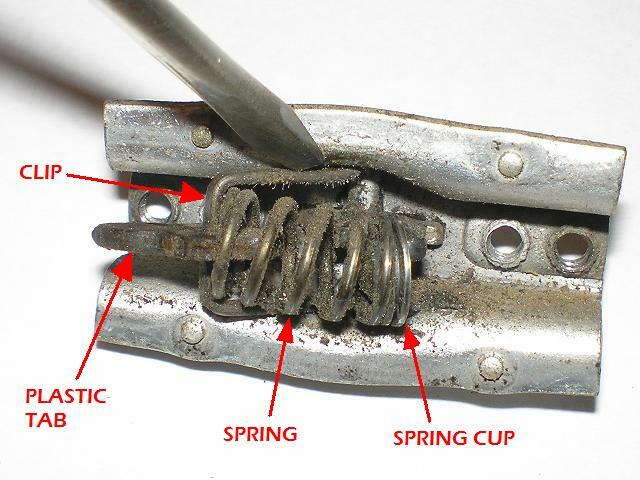 Use a small screwdriver to depress the clip, but be prepared to catch the spring and other small parts (also see below). They tend to jump when released. A word about toggle pins. 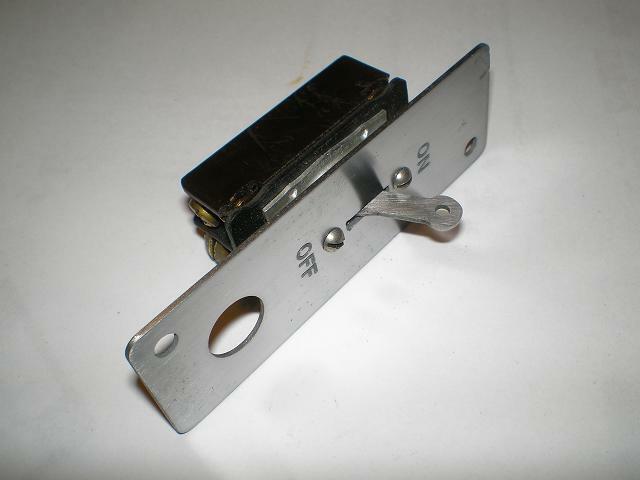 . .
On this switch the toggle pin is large on one end and narrow on the other. The thin end has a small pressed-on sleeve to hold the toggle in place. When the sleeve is off, the toggle fits snuggly on the narrow end of the pin. The skinny part of the pin is even skinnier in the center, so the toggle is free to move when the toggle is pressed onto the skinny end all the way over to the center of the pin. In the picture above, the pin end closest to the arrow point is the large end. 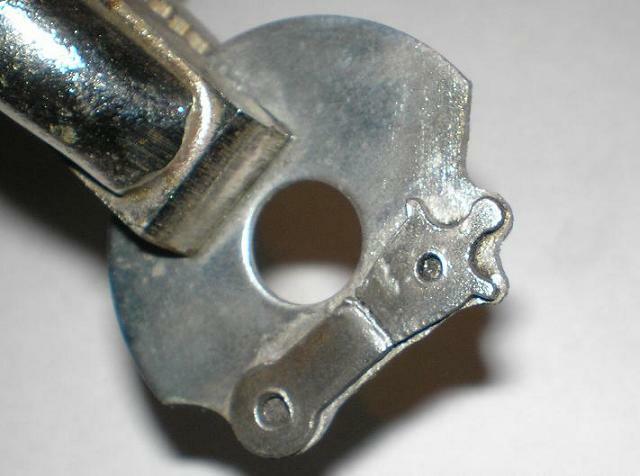 The visible part of the other end is the sleeve; note that it has a flared end. Clear enough so far? No? See the drawing below. Take a moment and peruse the first picture in this post and notice that the pen end is flared and dimpled. The sleeve appears to have been spun-pressed almost like a hollow rivet. Don’t simply grind this off to loosen the sleeve. You will need all the length you can get. I pressed the flare back down with pliers and worked the sleeve off with a screw driver and pliers by prying, tugging, twisting, pulling… (see below) Don’t worry about the sleeve. It won’t survive. We’ll replace this later with brass. SAVE THE PIN at all costs. The second pin type is solid and has no sleeve. Instead, it simply has a swell pressed into the center of the pin. 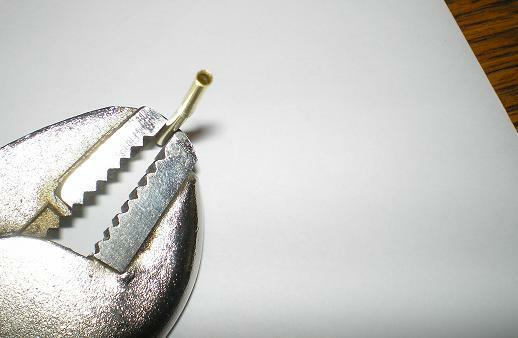 The toggle is pressed solidly onto this swell, which is unlike pin type one in which the toggle fits loosely on the pin. This fits much like a bearing on a knurled shaft. You’ll notice this difference if you see it. 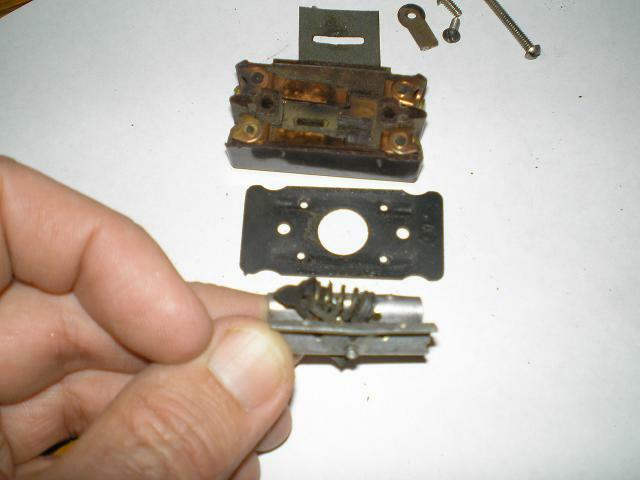 I was fortunate to have both pieces of my broken toggle. However, the inside toggle piece is the critical piece, and, obviously, never missing. If the top is missing, wing it and recreate the simple Delta design. Or, now is your chance to get creative and use a design of your own. I used a piece of scrap, a washer, of the same thickness as a replacement for my toggle. Well, actually it is slightly thicker, but don’t go too thick or it won’t fit in the slot on the switch top. Solder the broken pieces onto the new metal. Next grind the edges of the washer close to the original toggle. I use a bench grinder to get close. I then got even closer with a Dremel and cut-off wheel. I like the cut-off wheel for tight, small, and accurate grinding. File the edges finished and drill the holes. 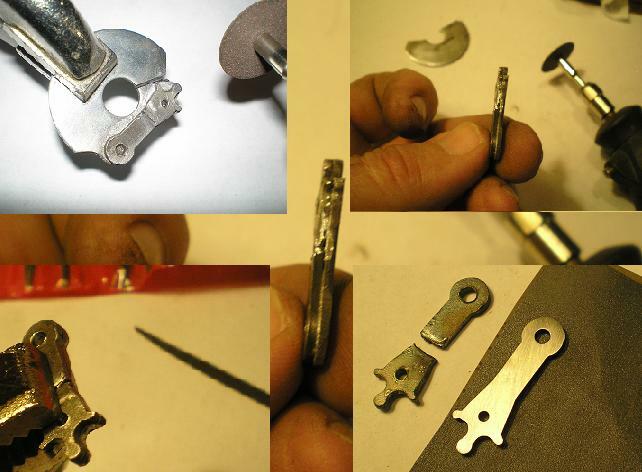 Then remove the soldered broken pieces and clean’er up. 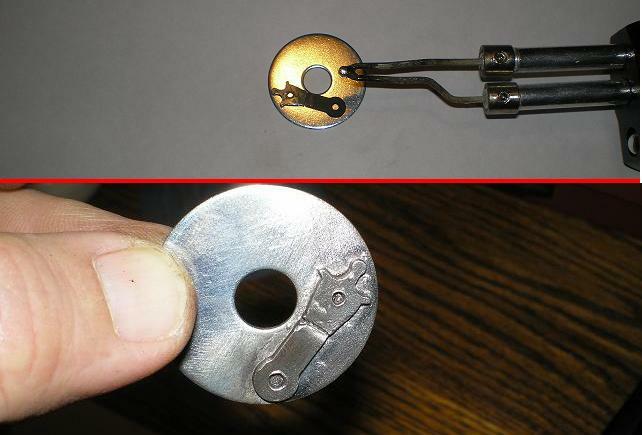 The small hole in the toggle should have a tight fit on the narrow end of the pin. I found that 5/64th fit nicely. . . this time. Remember that the pin is narrower in the middle. The toggle will be snug as it’s pressed until it hits home in the center. The idea for this process came to me suddenly when I was a teenager back in the 70’s. I asked, “Dad, can I borrow the car keys?” (light bulb=”on”). 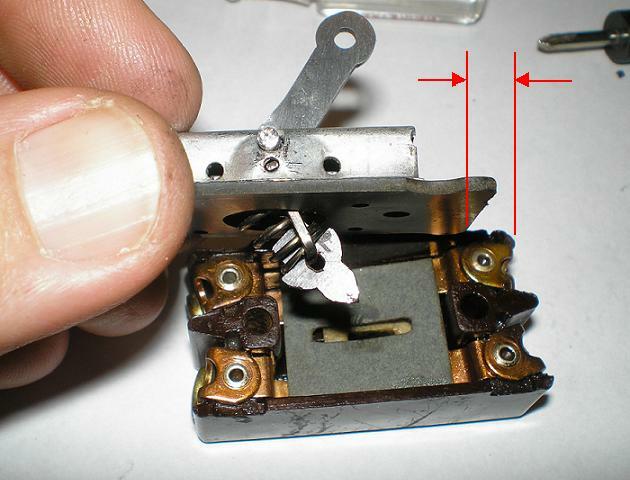 There are two problems that I created which must be fixed before this switch can be reassembled. 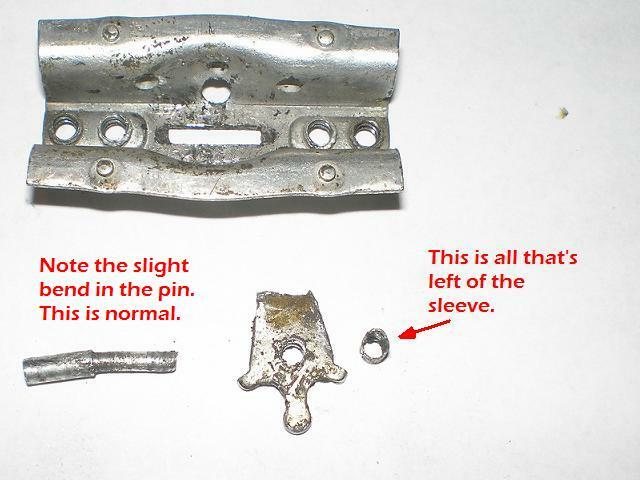 The Sleeve for the toggle pin is destroyed and the bolts are too short now. I made a new sleeve from 3/32nd brass tubing, which has too small of an ID. I drilled it out to 5/64 for that snug fit. This was surprisingly easy, clamped in a vise grip. The new sleeve is pressed (twisted, pushed, turned, and wriggled) back on. The fit seemed snug enough that I didn’t need that drop of solder I planned for on the end which was once spun-pressed. But, at least I crimped the sleeve with dikes for good measure (see below). Note above how the end of the pin still has the original dimple. The short bolts are fixed by merely countersinking the bolt holes on the bottom of the Bakelite by another 32nd or so. Set the stop on the drill press. 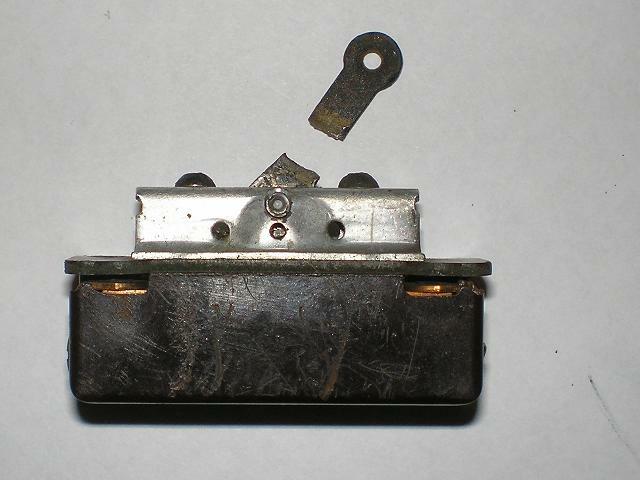 There is plenty of depth in the Bakelite switch bottom to handle a slightly deeper hole. Reassemble the switch top in the same order as the pictures above. Place the switch top over the base as pictured below. Be careful to position the base and top in the correct direction. Also, the slot visible below inside the base is the part that moves back and forth to turn the switch on and off. It and the plastic tab must be in the forward position. The top should be placed on the base set back about ¼ inch so the plastic tab will line up with the slot. Note the gap in the photo above. Hold the switch together while the top is off kilter and slide the top into position. Then the bolts can be screwed in from the bottom. Now is the time to test the switch. The final step will be to solder the bolts on the switch top. 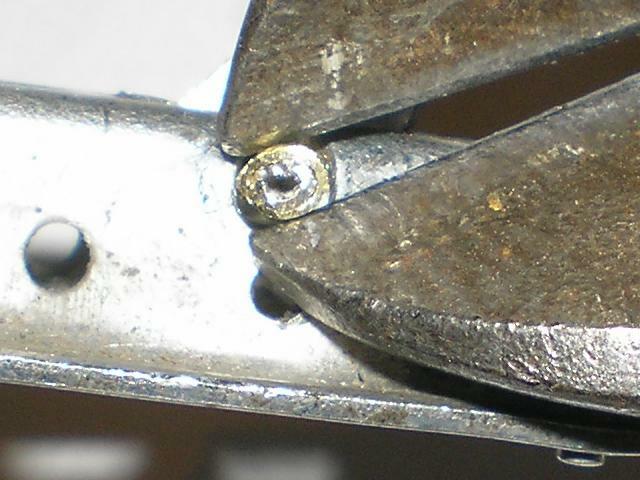 This is the alternative to crimping the bolts, as Cutler Hammer had done originally. 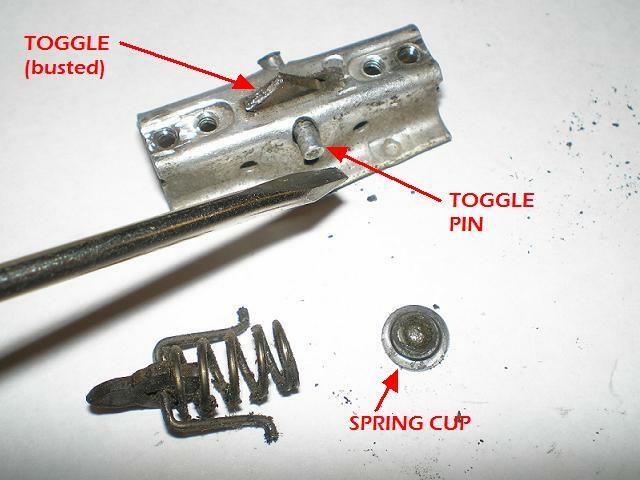 Thus, test now in case any parts are backward, or the plastic tab misaligned during assembly, or, or ,or …the bolts can be easily removed and the switch fixed. Of course, test for continuity on each pole while the switch is on and for no continuity while in the off position. Furthermore, remember to test the continuity from all the poles to the toggle and the metal top with the switch in the on and off position. No shorts! A repair to a similar switch was discussed in another forum thread: Delta #1115 Switch Repair.